Tantra considers the universe to be a manifestation of pure consciousness. Through this process of manifesting, consciousness divides itself into two parts, which cannot exist without one another (though appearing to divide, they actually remain one and the same). One aspect remains as a static, formless quality (shiva), while the other is a dynamic, creative aspect (shakti). The two eternally coexist, like ink and the written word, which, though one and the same, are different. The journey of Tantra is to know them both, at once, as one. Through a process of kundalini awakening, the two are eventually experienced in their state of union. In the Himalayan tradition, Yoga, Vedanta, and Tantra are companion practices. It is often taught that there are two schools of Tantra, the left-handed path and the right-handed path, depending on the nature of the practices. However, these two are actually divisions within one school, that of Kaula Tantra. The other two are the Mishra and Samaya schools of Tantra. All systems or methods of Tantra fall into one of these three schools, though there may be many subdivisions within these three. The Kaula Tantra school utilizes external practices and rituals, while the Samaya school is completely an internal process. The Mishra Tantra school mixes the external practices and rituals, along with internal practices. The three schools are progressively higher, with Kaula Tantra being the lower, Mishra Tantra going further inward, and Samaya Tantra for those who are prepared to do the advanced practices. By being aware of all three schools of Tantra, one can more wisely see how Tantra might fit into his or her personal spiritual practices, not limiting one's scope to the choice between the two Kaula Tantra paths. Each of the three schools of Tantra believe in purifying of the body, breath, mind, and the latent impressions called samskaras, which are the driving force behind karma. The purifying process is called bhutashuddhi, which means purifying of the five elements of earth, water, fire, air, and space in the various ways in which they manifest. Each of the schools of Tantra also practice methods for awakening the spiritual energy of kundalini, though the methods and the height attained in that kundalini awakening may differ. Some of the methods of Tantra are taught under the names Kundalini Yoga or Kriya Yoga. Kaula Tantra is external Tantra that focuses on concrete practices and rituals. The left-handed Tantrics perform their worships with the use of meat, fish, intoxicants, mudras (certain gestures), and sexual contact. The right-handed Tantrics perform these rituals only symbolically. Kaula Tantra focuses its practice on the Muladhara chakra, the first chakra, at the base of the spine. The Kaula Tantra practices are training for having control over the lower desires and physical needs of the body. The energy of the kundalini awakening is considered the divine feminine force, and is to be revered rather than used for mere sensual gratification. Some right-handed Kaula Tantrics explain that their practice is higher than the left-handed, by virtue of the right-handed practices being only symbolic. Some of the practitioners of left-handed Tantrics explain that their practices are higher than the right-handed by virtue of their secrecy, pointing out that it is harder to find a teacher of these processes. However, both schools of Kaula Tantra will sometimes miss the fact that Mishra Tantra and Samaya Tantra schools are still more advanced than either of the Kaula Tantra schools. Possibly this is because of human nature that wants to justify a current level of attainment as higher than it really is. Swami Rama has explained that Kaula Tantra is for those who are not very intellectual and have less awareness, that it is for the third class student, while Mishra Tantra and Samaya Tantra are for the second and first class student. Much has been written about Kaula Tantra practices (though much more is not written). The Sanskrit scholars have access to many thousands of hand-written manuscripts about the mantras and rituals that go along with these practices. Some of these are reportedly useful, while others have been called little more than gossip. For the student seeking this path, there appears to be many choices of places to go, people to learn from, books and manuscripts to read, and rituals to perform. It is no wonder that Kaula Tantra is the Tantra that has become so well known in these modern times. However, the student would do well to be wary when choosing a teacher, as there seems to be a great deal of less than authentic guidance available. Some of the modern behaviors that have been labeled Tantra are only hedonism given a spiritual name, and are taught by people with little knowledge or experience of authentic Kaula Tantra or the higher schools of Tantra. Higher than the Kaula Tantra school is the Mishra school of Tantra. Mishra Tantra performs both external and internal rituals, and is thus a mixture. Mishra means mixed. Mishra Tantra focuses its practice on the Anahata chakra, the fourth chakra, at the heart center, where there is devotion practiced to the mother, feminine, or creative principle of the universe. The Mishra Tantra practices are inner practices (antaryaga), and direct the one-pointed mind inward. The pujas, or rituals are done in the field of mind, and are thus referred to as manas puja, or mental rituals. These pujas are done with feelings of devotion and non-attachment, and do not involve any external objects. The energy from kundalini awakening is brought upward from the root chakra to the heart chakra, the space between the breasts, where it is experienced as a relationship with the divine. Higher than both the Kaula Tantra and Mishra Tantra schools is the Samaya school of Tantra. It is a purely yogic practice, without any external rituals. Its entire purpose is Self-Realization, ultimately leading to moksha, final liberation. The word Samaya literally means "I am with you," referring to the bestowing of shakti from within through shaktipat (not that an external person is with you). Through meditation and this divine inner companionship, the aspirant is guided in non-attachment to the external pleasures, channeling the energy of kundalini awakening ever upward to spiritual union. Samaya Tantra seeks to practice at the Sahasrara chakra, the seventh of the seven major chakras, at the crown of the head. Along the upward journey (urdhva retas), each of the other chakras is illumined by the awakened kundalini. The meditators of the Samaya Tantra school focus on the Ajna chakra, in the space between the eyebrows, after which the antaryaga, inner practice, is done in the Sahasrara, crown chakra. Samaya Tantra and Raja Yoga (Yoga Sutras) are similar, though the Samaya Tantra practice is subtler, and is a path practiced by very few people. It is the most advanced of the schools of Yoga and Yoga meditation. Samaya Tantra practices Sri Vidya, the mother of all the vidyas (ways of knowing). Because of its subtler nature, and the fact that the higher teachings are imparted in meditation, rather than on meditation, there is far less written about Samaya Tantra than Kaula Tantra or Raja Yoga. The aspirant purifies the samskaras through the fire of guru chakra, as well as receiving the downward flowing intuitions. Tripura: In the Himalayan tradition, the aspirant clears the mind through the practice of Yoga meditation as codified in the Yoga Sutras by Patanjali, does self-enquiry of Vedanta, and then breaks through the final barrier with Samaya Tantra and Sri Vidya (The practices of Sri Vidya are said to have been known to the more esoteric practitioners of the worlds most known religions, although they have been lost publicly over time). 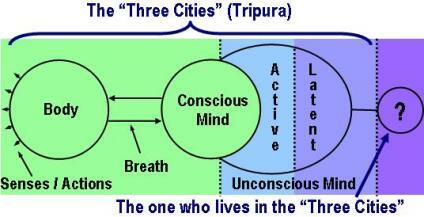 Central to the practices is Maha Tripura Sundari, the great, beautiful one, essence, consciousness, or reality that dwells in the three "cities" (tripura, or three cities including: gross, subtle, causal; waking, dreaming, sleeping; conscious, unconscious, subconscious). After the aspirant is fully prepared, the meditation in the eyebrow center, Ajna chakra, eventually reveals the channel called brahma nadi, which is an extension of the sushumna channel of the subtle spine. Awareness travels up that nadi, and encounters and meditates on the point called bindu, which is like a pearl, and is the point of emergence of the mind itself. Then, when the student is ready, the pearl is pierced, or exploded through the gift of consciousness or shakti, which is called shaktipat, and is the grace of the teaching spirit called Guru. Like crashing through a series of walls, one experiences many layers of consciousness, and finally emerges into the realization of the Absolute Reality, the union of the static and dynamic principles. Samaya Tantra is ultimately more like a deep communion with the creative force of the universe, than worship in a ritualistic sense. It brings an intense and inexplicable joy that is beyond time, space and causation, as one becomes like a divine child, frolicking in the union of the mother and father principles of the universe, which is the oneness of all. Not only is there realization in itself, but there is also an outward flowing of the effect of this through each of the koshas. Tantra has to do with the subtle energy that is behind, or is the ground of the entire physical and mental aspects of our being. On the spiritual journey, the sincere seeker will ultimately encounter the energy of kundalini awakening, regardless of what path is chosen. This encounter is unavoidable for the simple reason that this energy truly is at the root of the grosser realities. Therefore, many spiritual practitioners choose to consciously work with this powerful force. For those with a theistic leaning, who enjoy the ritual aspects of practice, Tantra is there to serve. For those whose inclination is to go directly into the inner energy, diving to the core of our own being, that too is there, within the teachings of Tantra, for those who are prepared. The choice rests with each individual, whether to pursue spirituality to this depth, or to stay in the shallow waters of mere belief systems. If the seeker decides to dive deep into the inner being, the different schools of Tantra offer the means to do so, in line with one's individual predispositions. In the tradition of the sages of the cave monasteries of the Himalayas, the kundalini awakening of Tantra does not stand alone as a practice. It is built on a foundation of purifying the mind through Yoga, as codified by Patanjali in the Yoga Sutras, and the practices of self-enquiry from Advaita Vedanta. Mantra has to do with sound vibration, at both its gross and subtle levels. 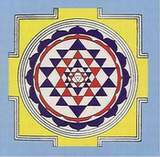 Yantra has to do with light vibration and its form, both at gross and subtle levels. Tantra has to do with the methods of dealing with, and going beyond both light and sound.